June … and none too Soon! As previously explained, various things delayed our May update. Cumulatively, this June update was also delayed. So I shall skip the usual goofy introduction. 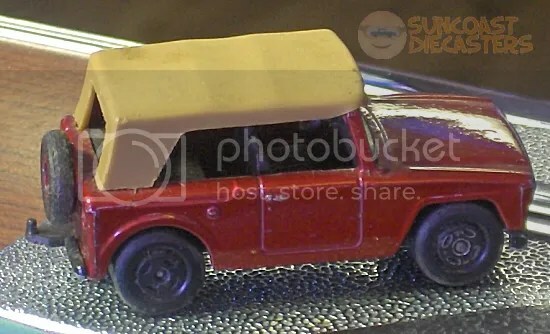 I do want to mention that we have a great new collector’s site at the top of our 1/64th-scale Links page, so please check it out! 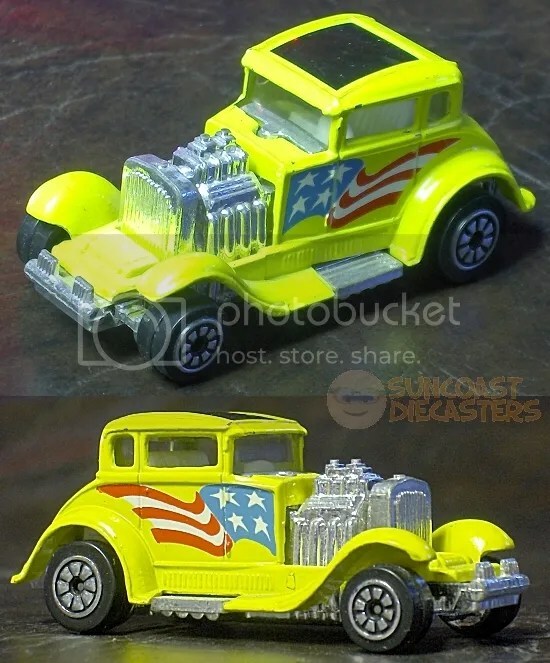 As a long-time, faithful reader of Suncoast Diecasters, you’re tempted to say, “Ah! A garbage truck! Surely this has been acquired by Original Ken!” Reasonable, but incorrect. 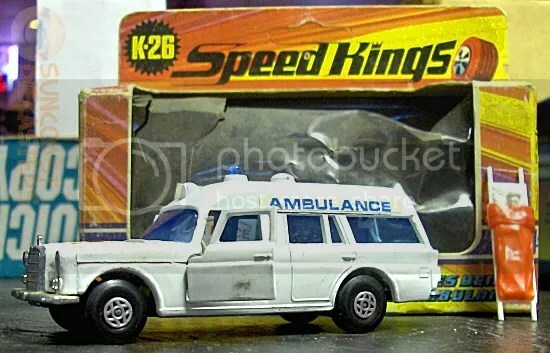 “Well, then,” you continue, “it certainly must belong to Emergency Back-up Ken!” Nnnnope. 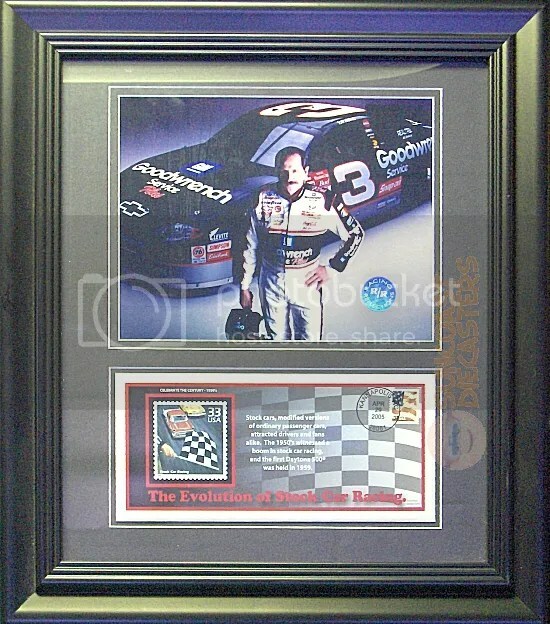 This was purchased by Gary — EBU Ken’s wingman — as a gift for his nephew. Ha! TOTALLY smoked you on that one! 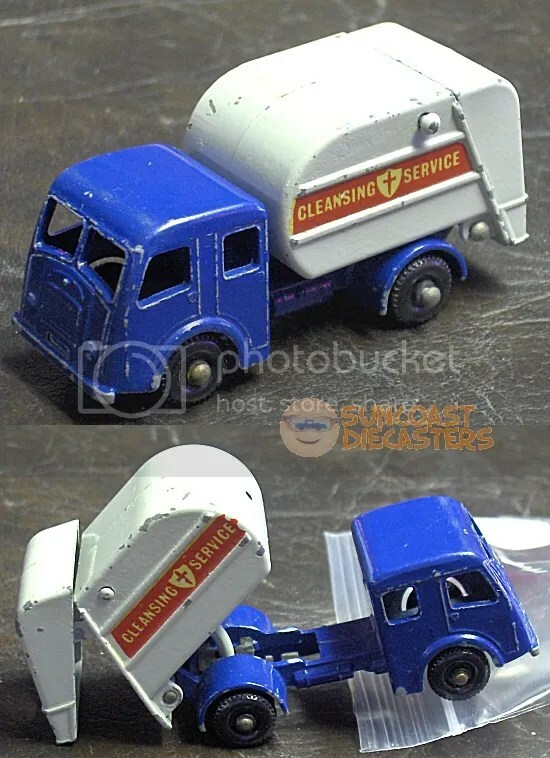 For your edification: It’s the Lesney (Matchbox) Refuse Truck, model 15-C, made in England. 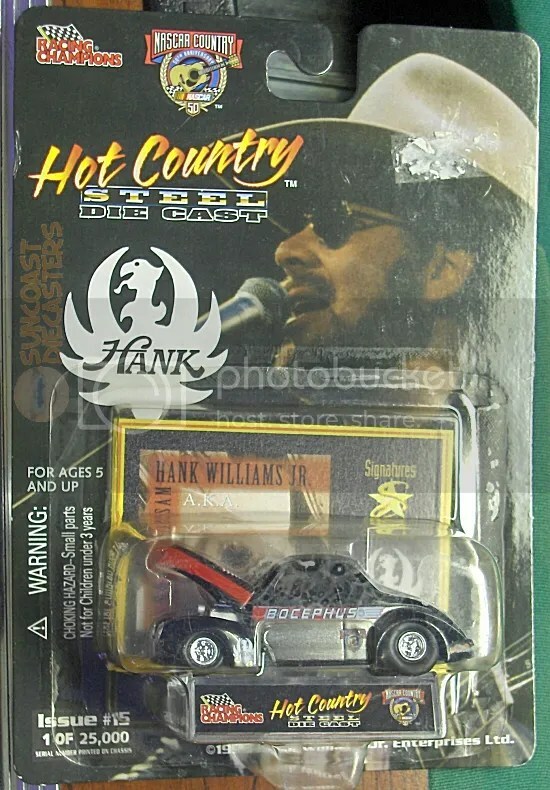 Now, here in fact is an Original Ken item: his other passion, Willyses …Willysesees … Willysoi …. 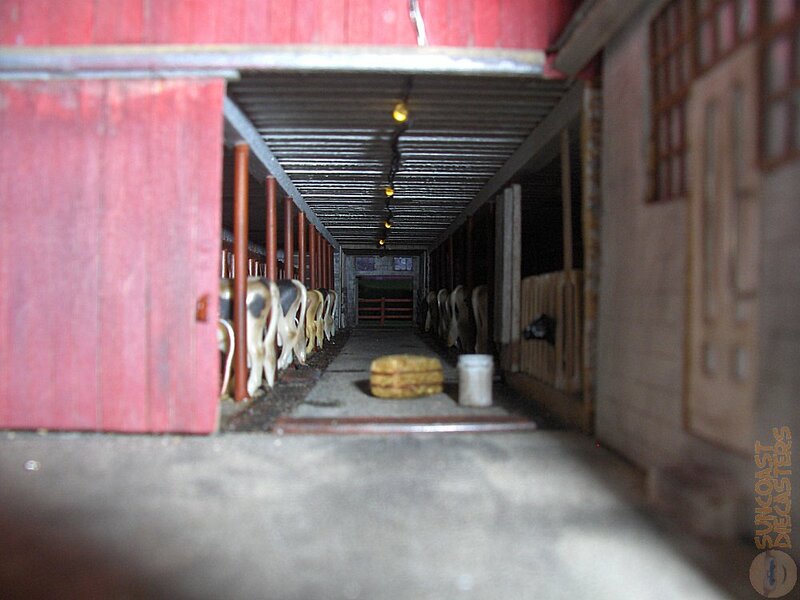 Anyway, Ken also collects Willys miniatures. In this case, the ’41 Willys done up as a Hot Rod magazine special edition. 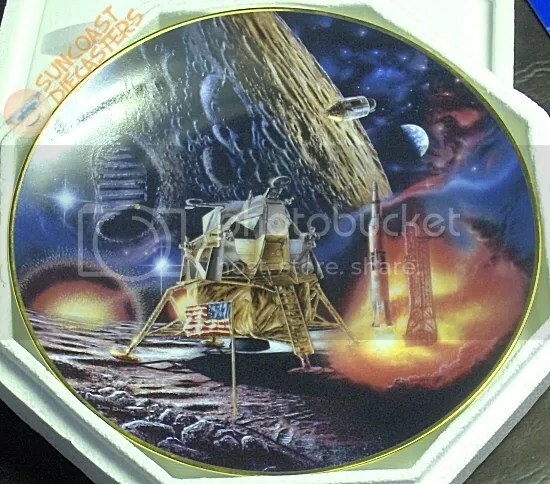 …And it looks just like the illustration. 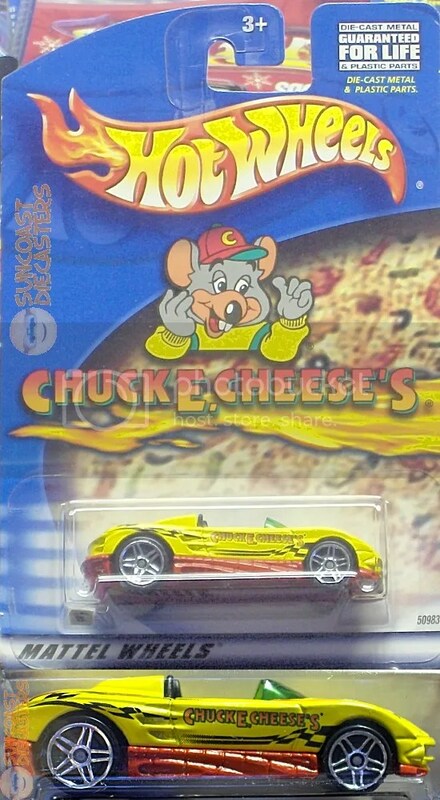 Ken got cheezy and nabbed this Chuck E. Cheese’s-edition MX48 Turbo. The MX48 actually comes from the Max Steel toy line — also by Mattel, conveniently. I’ve been trying to come up with a funny caption involving ”cheese” and ”turbo”, but, sorry, I got nothin’. 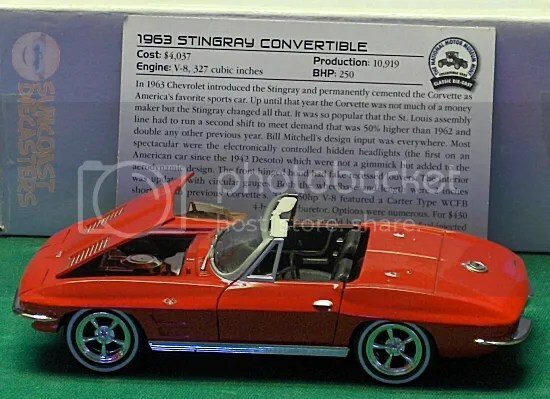 Big Tractor Mike goes all literary again with two tomes: First is this Beckett Price Guide, which is actually very dear to all Suncoast Diecasters members, because we is included in it. Yes, as a genuinely published club, we thus officially exist. 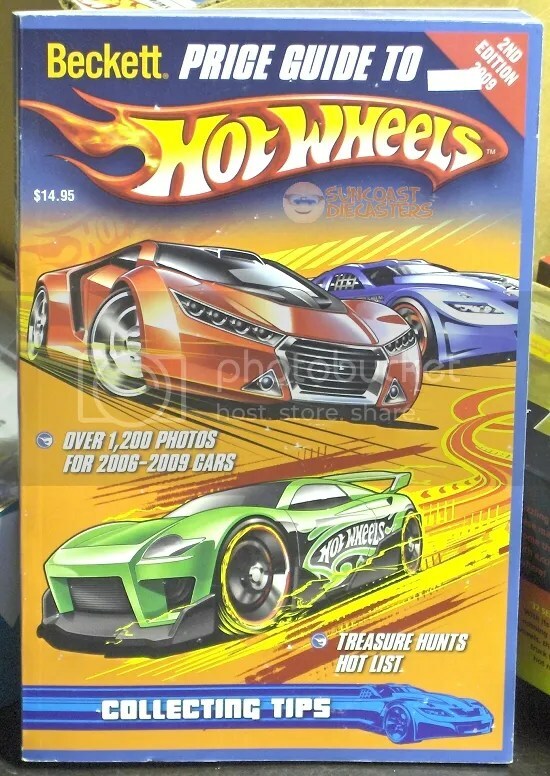 …And second is this history of Hot Wheels, the amazing story of how a toy company has lasted despite making only one toy. 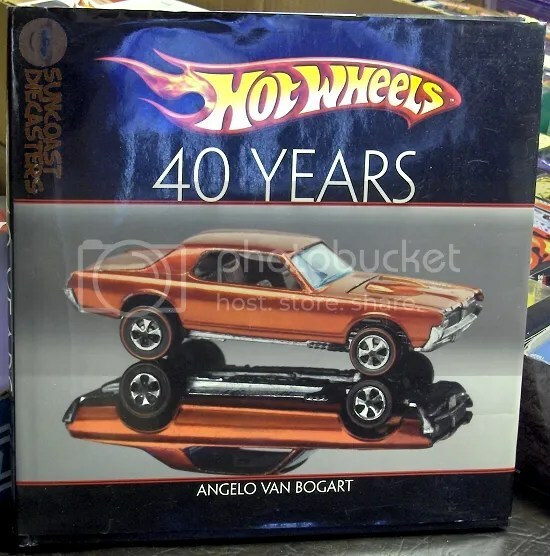 Yep, just this one toy car, for 40 … loonnng … years…. 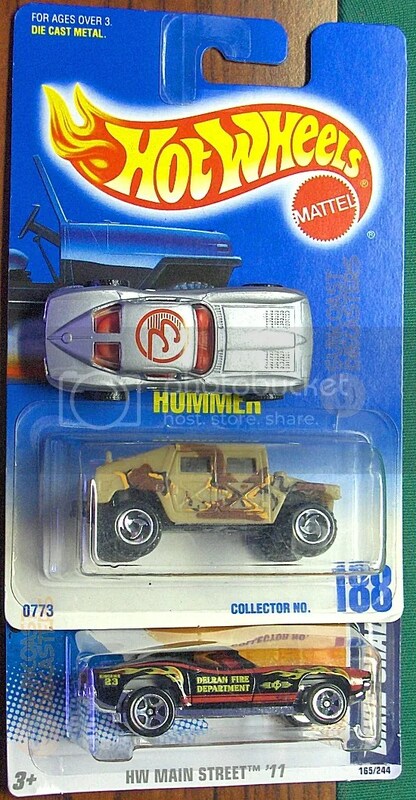 …And then wisely bought this beautiful 1970 Heavyweights-series Dump Truck. From the brilliant mind of Ira Gilford. 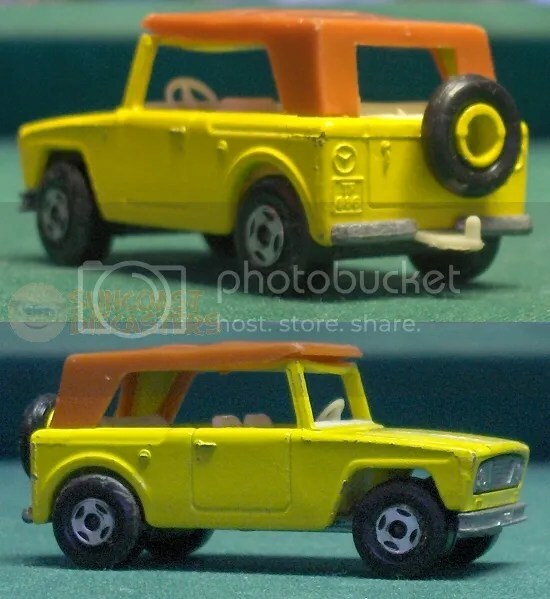 Doug flatbedded this VW pick-up. 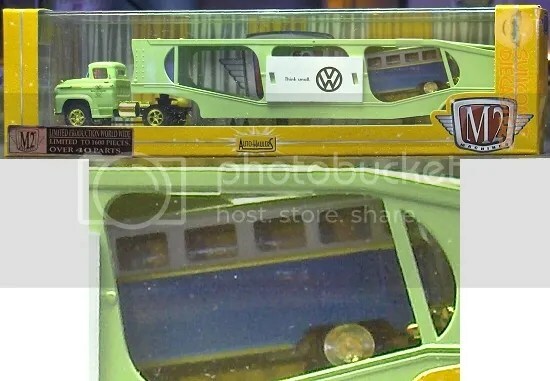 I mean, Doug picked up this VW flatbed. By Jada. I mean, by Jada. 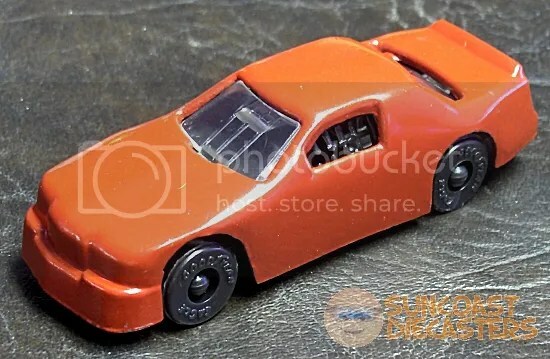 From: BTM, this curious item, To: Doug’s li’l boy, is a Stock Car Miniature. That’s actually the brand name. 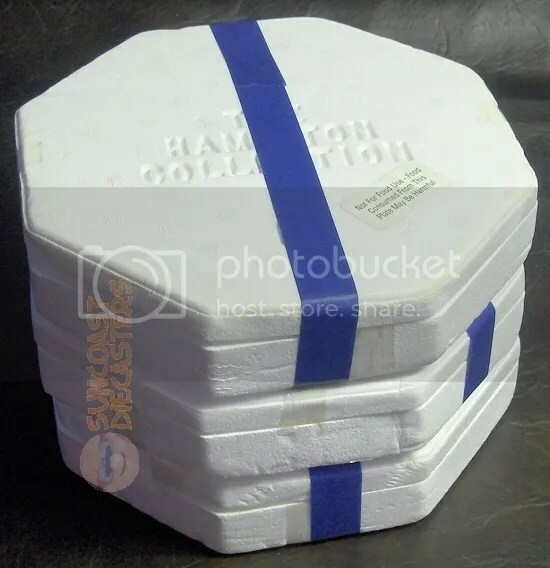 As Ken explained, and is further verified by this ebay article, SCM (as it’s known among fans and collectors) was the first toy company to specifically bring NASCAR and other pro-racing names to the collector market. Poor choice in business location combined with a highly questionable zoning board decision led to the company’s downfall. This … is the face … of a man in pain. Or, a man in plastic. 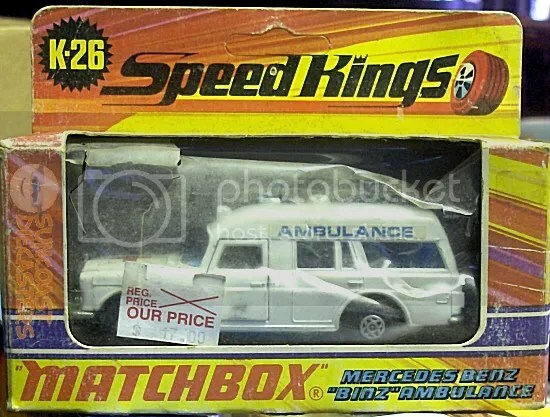 Yeah, the cellophane’s damaged, but still: ”original box”! 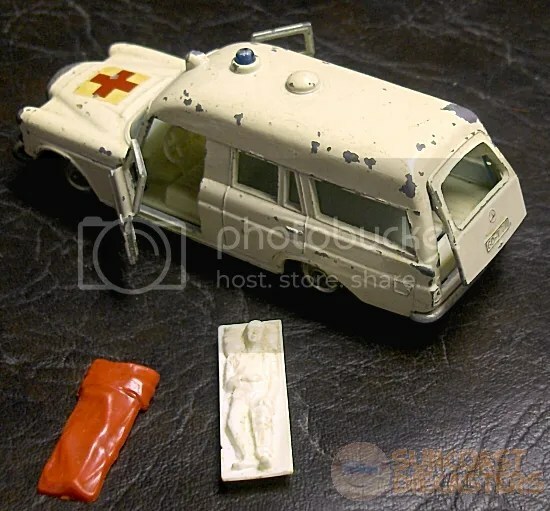 …So, naturally I take photos of it, delighted to discover the model also still has the original “man on stretcher”, and in good condition. I mean, you know, good condition for a guy on a stretcher. A few moments later, BTM RAOKs Ed with his other Binzulance, which also still has “Ye Man uponne Stretcher” … Only, not in so good a condition, as the “blanket” fell off instantly (not to mention the stretcher’s handles are broken off). 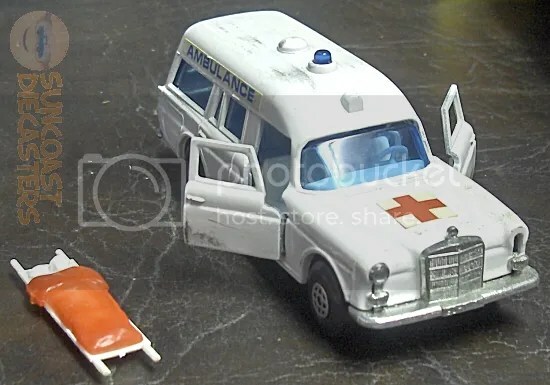 ”Stretcher falls out of ambulance onto ground” — Comedy GOLD! 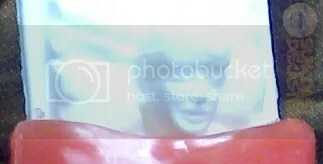 I was intrigued to notice there was significant sculpting of the poor guy’s face, so I propped him up and took a photo, from which I cropped the portrait that started this whole adventure. I presumed that the guy’s face was all there was to him, that the blanket piece covered basically nothing. Imagine my surprise when, upon looking more closely at the broken stretcher, I realized the patient is a full head-to-foot sculpture, with impressive — indeed, let me say thoughtful — detail. His shirt is open, but he clearly has an undershirt. No shoes, but he’s not barefoot, he’s wearing socks. Most impressively, he has some sort of splint or brace on his left leg. You can check out the guy’s vitals here. 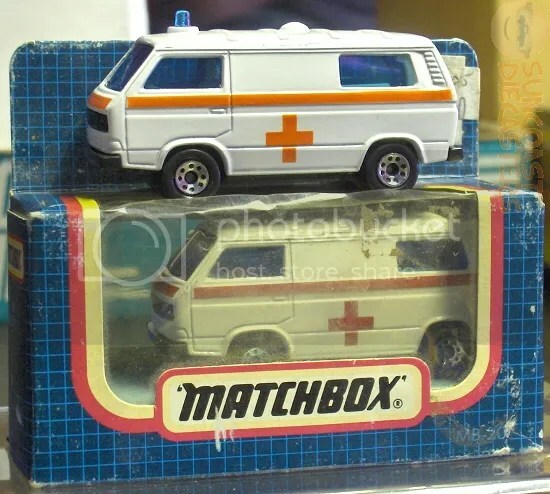 For its great physical condition, its original box, its opening doors and hatch, and particularly for its completeness in not only still having its patient, but also because that accessory is itself in great condition, I very easily declare this Matchbox Ambulance to be Suncoast Diecasters‘ Find of the Month(*) for June 2016. 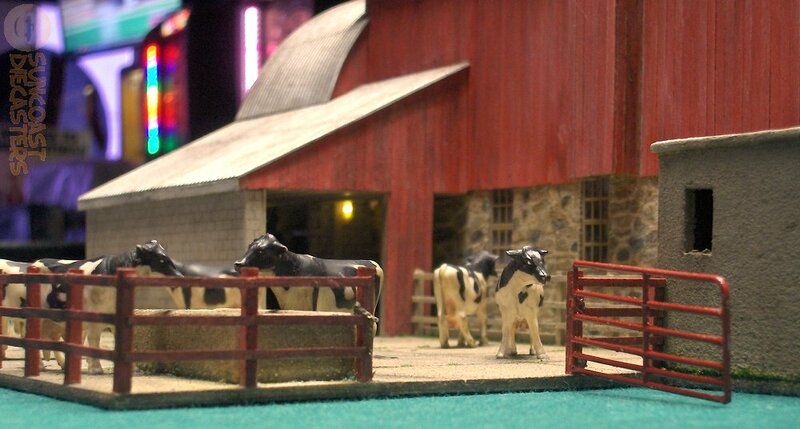 This is not merely a great model for FotM, it’s one of the coolest FotMs we’ve ever had. Well done, Ed, well done! Get yourself some free Binz wallpaper. See you at the July– er, I mean August meeting! While briefly reviewing some of our site’s pages, I discovered much to my shock that the map graphic had disappeared from our About page. It wasn’t much, basically a line drawing, but I put in on the page as a courtesy to you Faithful Visitors. Don’t know when or why it vanished, but I have redrawn it, and it’s there now for your visual edification. 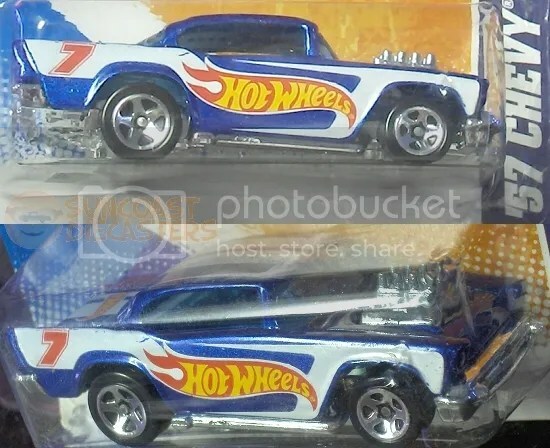 If you’ll recall from our July ’15 update, I teased this M2 Machines car hauler offered by Big Tractor Mike. 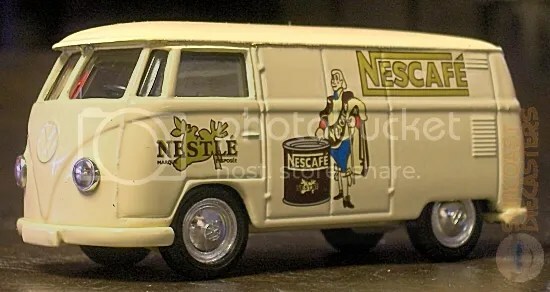 It’s a chase version, with an exclusive VW Type 2 tucked inside like a delicious nougatty center (he said metaphorically). Tom, as Suncoast Diecasters‘ Viscount of VWs, finally added it to his own collection. What I didn’t notice back in July is this exclusivity call-out on the top of the box. 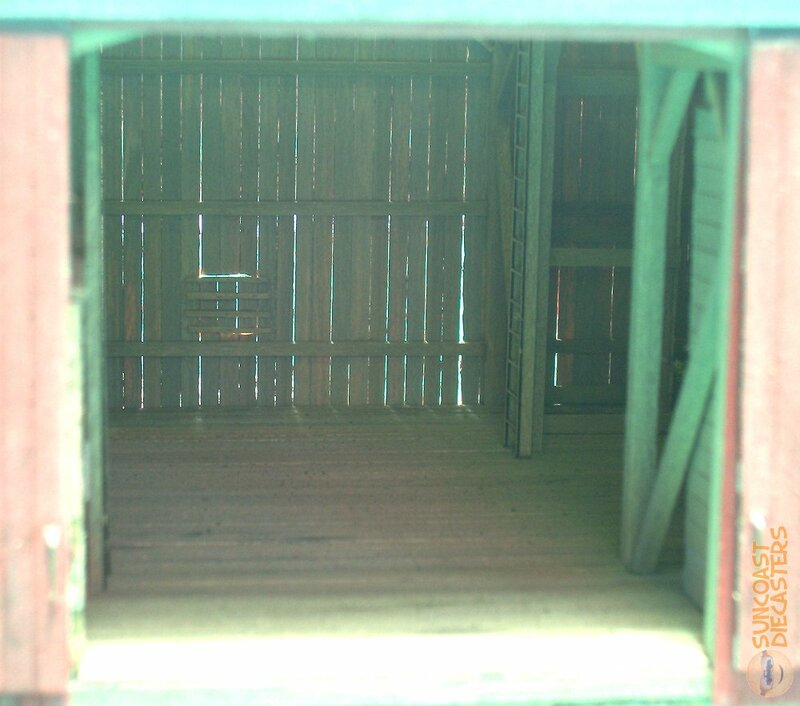 I had already packed away my camera before I spotted this, so I took this shot with the humble little convenience camera built into my phone. 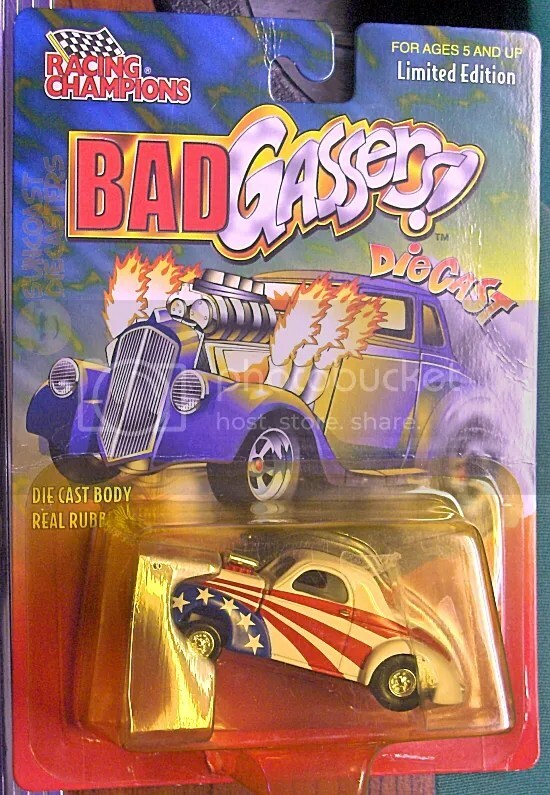 Tom continues VW’ing with this rare, odd gem. It too is a Type 2, commercial panel version, from Lledo’s “Days Gone” series. 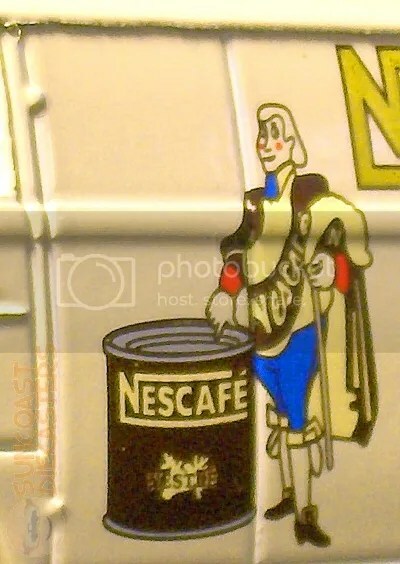 What makes it odd is the Nescafé illustration featuring an unidentidied but gallant fellow I have dubbed “Sir Nescafé”. 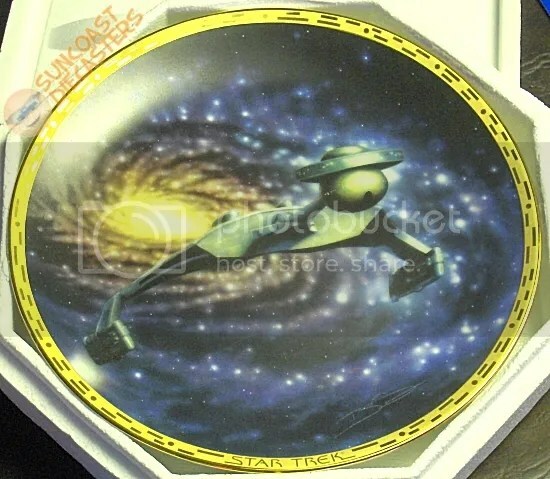 In trying to identify our handsome chap, I’ve found a couple of other collectors’ photos of this model with this illustration, but I haven’t found any data on the character himself. The Nescafé home site itself proved useless in this regard; worse, it seems to think it’s Windows 8. However, the Taster’s Choice history page states that Nescafé was developed in Nestlé’s Swiss labs. So, perhaps our bon vivant‘s design — and this is strictly a guess — is loosely based on the uniform of the Swiss Guard. This is good coffee. You can trust a man in pantaloons. Good friend Ed put in a rare appearance at our January meeting, and he brought wide array of cars. 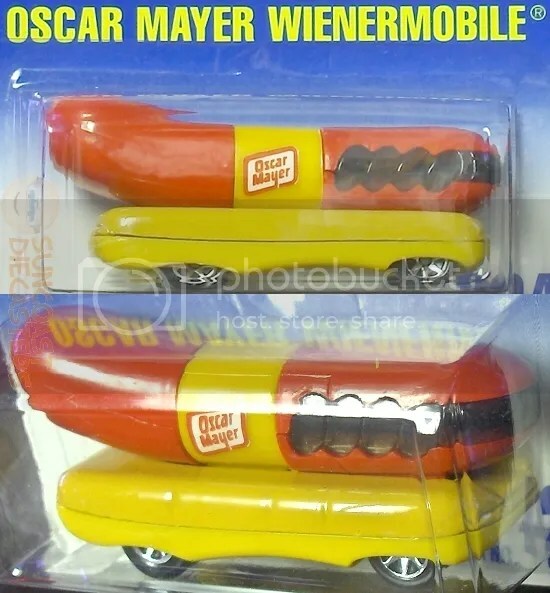 From him I bought this ’57 Chevy in sweet Hot Wheels livery, and this Oscar Mayer Wienermobile. I have an OMWmobile, loose. I don’t think I have one still on its card, so snagging this one from Ed was an easy decision. Did I say sweet? I meant sweeeeet! 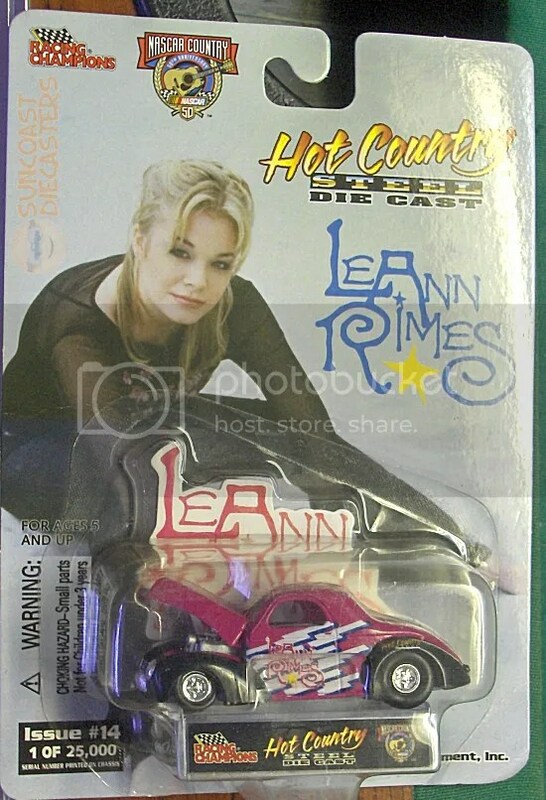 There are no circumstances under which this toy is not cool. 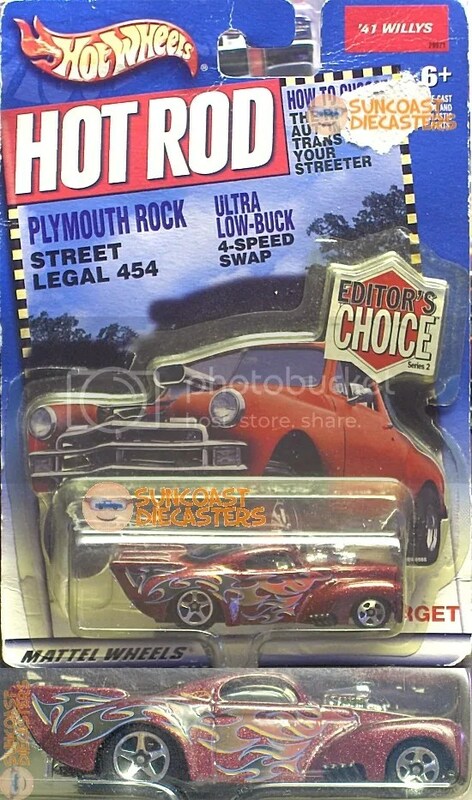 Classic hot rod styling: A massive power plant and a vintage body. Can you believe this?!!? Big Tractor Mike gave me a lump of coal! Da noive!!! I suppose next year he’ll give me a waffle iron. 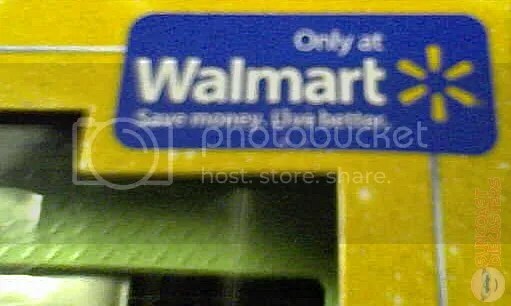 Okay, perhaps this is a clue: The embossed Matchbox logo. 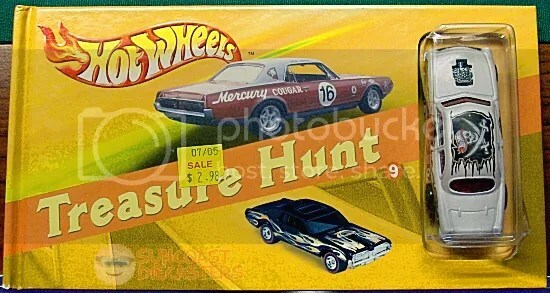 In the mid-2000s, Matchbox issued “Coal Cars”, Christmas-themed cars hidden inside “lump of coal” shells. 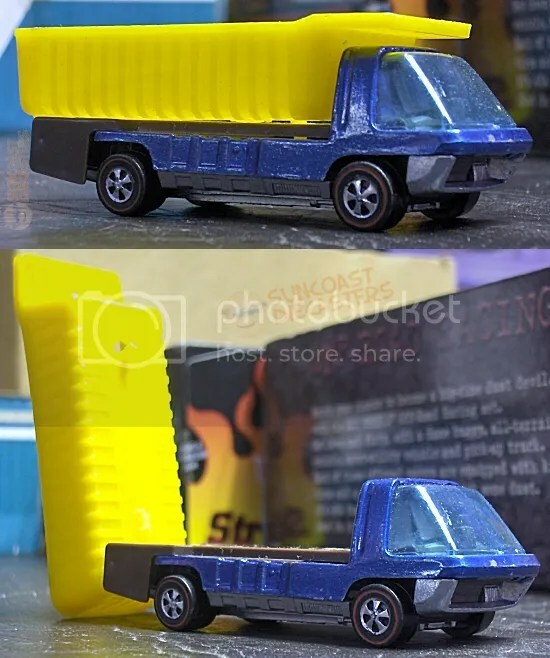 So, which Matchbox car did I find inside this RAOK? Because you strike matches on coal. HA! 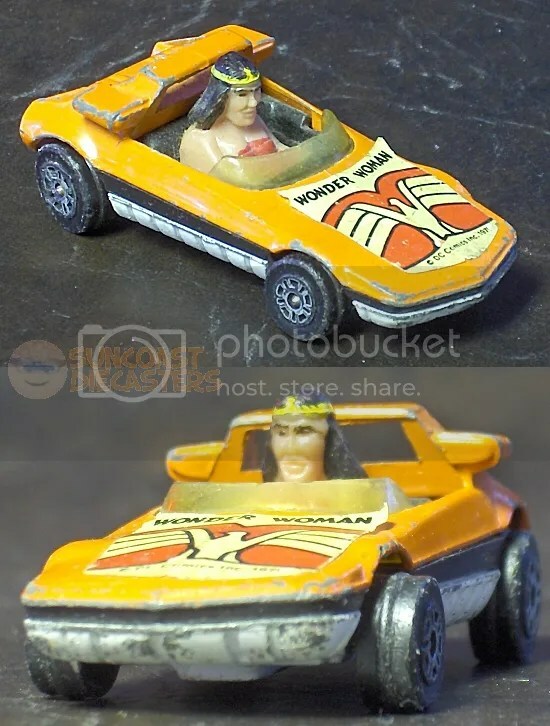 It’s actually a Bertone Runabout Concept, by Corgi, repurposed as the Wonder Woman-mobile. 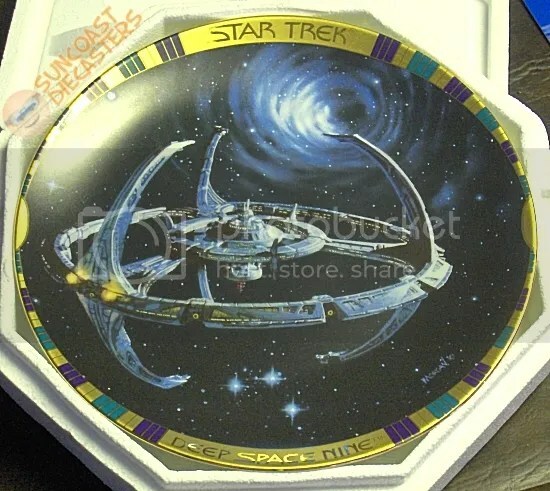 This is an exceptionally cool gift from BTM, in that the Runabout is a very rare model. Although, that may in fact be an inaccurate statement as I now own four of them, including another WW car. 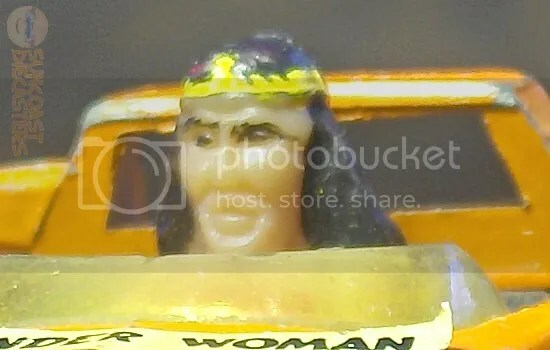 Wonder Woman, as portrayed by Nicolas Cage. 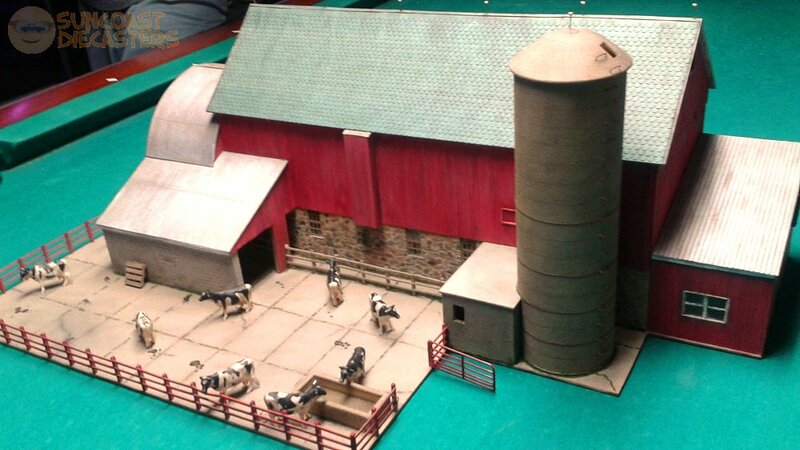 Back in August, Doug brought in a retro-repro Sizzlers track set. Well, for our January meeting he upped his game, and his technology, by bringing in this Anki Overdrive race set. He got it for his son for Christmas, then thought better of it and brought it in for us to play with. 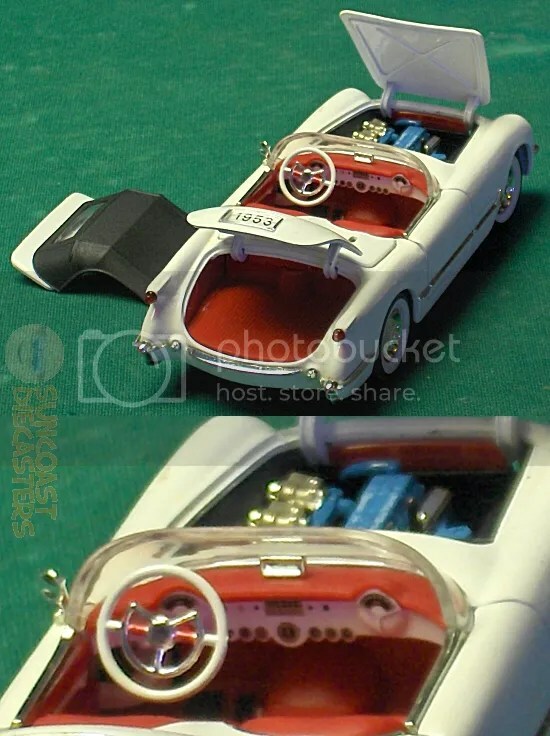 Before we get to the video (yes, your Humble Webmaster dutifully shot some race footage), I want to point out the one thing I consider a significant drawback in the Anki concept: it requires a smart phone to actually operate it; there is no separate controller device for the vehicles. I know many folks have smart phones these days, but I would suggest to Anki that they develop a stand-alone controller, because I think that would increase their market share. Okay, needling little rant over; onto the race! In the opening segment, the cars seem to be going very slowly. In fact, they are, because they’re “learning” the track (leading Doug and myself to conjecture that there’s a filament (or something) embedded in the track sections to which the vehicles respond). Once the track is learned, the cars automatically pull up to the starting line, and the race may begin. 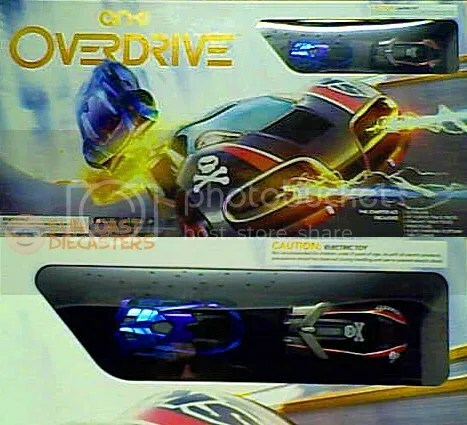 Overdrive combines the control of slot cars, the rechargeable ease of Sizzlers and both the interactivity and weapons options of video games. Enjoy the video! 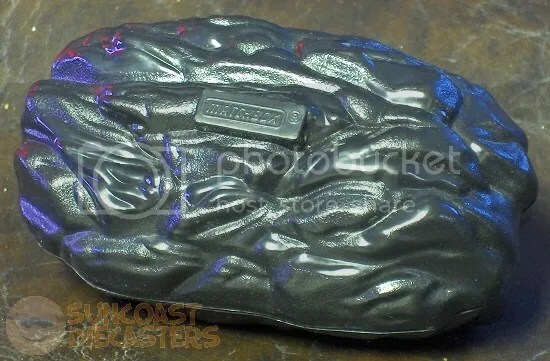 SD in: Overdrive from Suncoast Diecasters on Vimeo. Notice how, near the end, Ken’s car came to a dead stop? It was “disabled” by a (virtual) weapon on Doug’s car. Neat stuff! A ”Fast Cars” book requires speed-reading! I love the concept of the book. 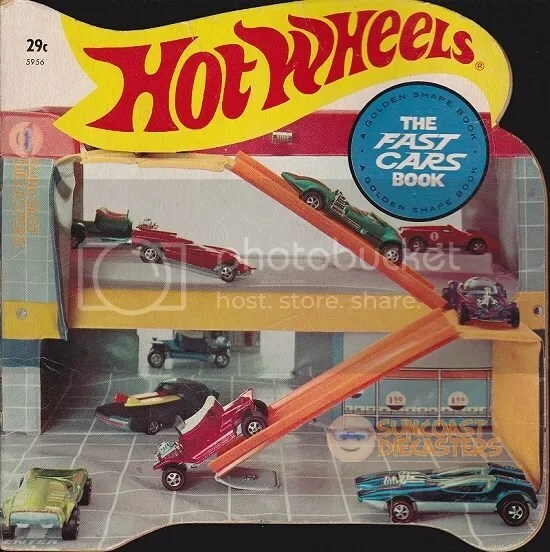 The first half features shots of HW cars on various track sections, while the second half is an “around the town” visual tale using the Parking Garage and Action City playsets. 2015 ended well, and 2016 has started out well. 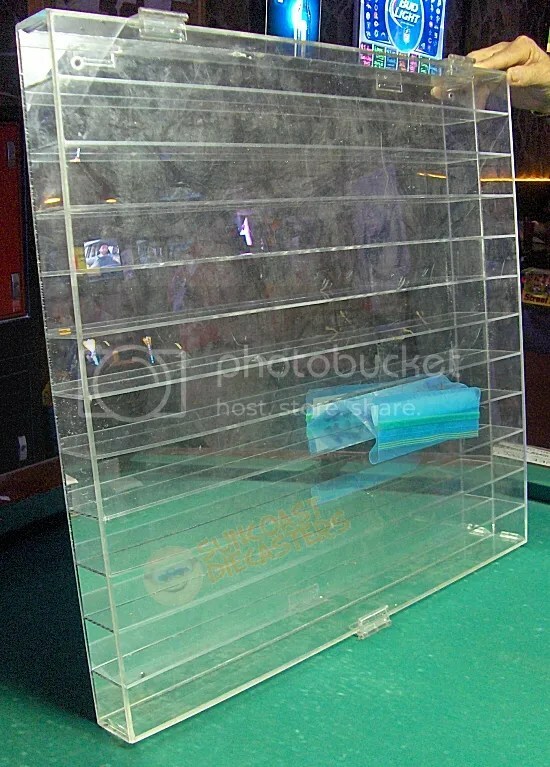 Looking forward to the first ’16 K-Day event (whenever it is). See you at the February meeting!